True Coal Harbour Penthouse Living! The magnificent Penthouse at the Sapphire! The ONLY penthouse atop the tower. Expanding 3,141 sf of elegant interior on a whole floor on 34th level w/ 4 spacious bdrms, each w/ ensuite, plus 2 stunning, RARE, EXCLUSIVE rooftop patios totaling 2,866 sf. 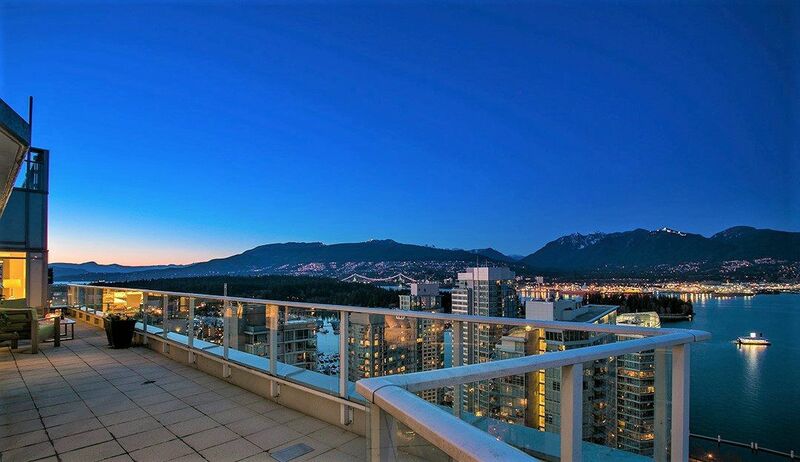 Capturing the panoramic & the most prestigious views of Coal Harbour, endless ocean & mountains, incl. the Lions, Cypress & Grouse, Stanley Park, Lions Gate Bridge, the marina & glittering city lights, fm sunrise to sunset. An EXCLUSIVE heated outdoor pool & hot tub on the rooftop patio. Chef's kitchen + a wok kitchen, luxurious finishing, open layout, 5 bathrooms, an exquisite office w/ skylight, upgraded in 2014. Concierge service. A perfect alchemy of luxury, prestige, exclusivity & celebration!